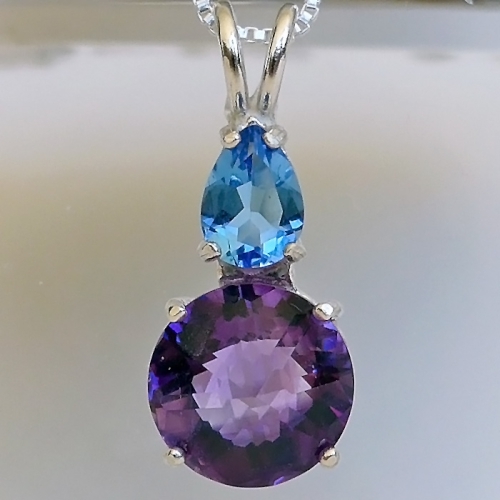 Dimensions (HxWxD): 0.85" x 0.375" x 0.375"
This stunning, water-clear richly hued violet colored Amethyst Mini Radiant Heart Pendant is crowned with a gorgeous, sparkling Blue Teardrop Shaped Obsidian gemstone. Tibetan Blue Obsidian comes from the banks of the Yarlung Zangbo River. The Zangbo is the highest altitude major river in the world, originating in the Tamlung Tso Lake in Western Tibet, southeast of Mount Kailash, one of the most sacred sites on Planet Earth. This pendant is set into a sterling silver setting which allows the stone to breath, and hangs on its sterling silver chain right on the thymus between the throat and the heart chakras, offering protection to the whole body resonating through the compassionate heart. 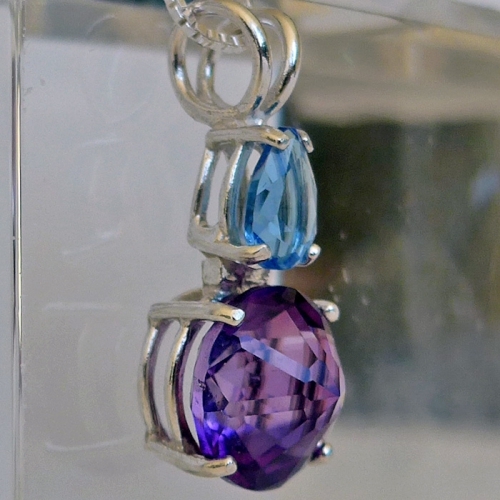 This pendant is both a Lightworker's power tool and gem aficionado's collector's item. The combination of Amethyst and Blue Obsidian energizes and activates the throat and crown chakras, enhancing the bearer's abiity to communicate spiritual truths and facilitating the ability to connect to inner spiritual guidance. Working on the heart, the fourth chakra, Rose de France amethyst works to transmute heartache, heartbreak and the deleterious effects of anger we have experienced in our lives, into the energy of unconditional love, healing the wounds we have suffered in our emotional body. Rose de France amethyst also empowers us and strengthens us by its energizing effect on the heart chakra, giving us the strength and courage we need to allow our selves to open our hearts fully and experience the compassion known by Jesus and Buddha , the joy and sorrow that accompany the awareness of the interdependence of all living beings. The color violet is associated with the crown chakra in the Western chakra system, and so this extremely light and bright violet amethyst is said by crystal healers to activate and energize the crown chakra, connecting the bearer to Higher Mind, Higher Realms and inner spiritual guidance from extremely elevated and reliable Sources. Under the guidance of the Great Alchemist, the Count de Saint Germain, New Age students of the Ancient Wisdom Teachings often utilize crystals and gemstones, along with meditation techniques, Reiki and past life regression therapy to access memories of past lives, and to release the detrimental patterns of behavior, negative emotions and outmoded mental maps of the world imprinted in our cells, our hearts, our minds and our karma from traumas experienced aeons ago. Because amethyst is a relatively hard gemstone, this amethyst can be safely carried in the pocket in its own pouch, which we provide free of charge. It is difficult to scratch amethyst, but care should be taken not to put the stone into one's pocket unprotected along with car keys or other metal objects. Amethyst can be placed in the sun for very short periods to charge the stone, but care should be taken not to overexpose the stone to sunlight over time, to prevent any fading. Alternatively, the stone can be placed outside in moonlight to absorb Universal Life Force Energy. My personal experience in using this stone for meditation and in Reiki healing sessions has been excellent. In meditation, this beautiful gemstone fits easily in the palm of the left hand, the receiving hand, and facilitates a connection to the Source of Universal Life Force Energy. I felt a very high frequency energy signature stimulating and opening the chakras in my hands, and then a flow of this same violet ray energy streaming up my arm and into my torso, solar plexus and "hara" center. My felt connection with my Guides and Teachers strengthened appreciably. I felt above all, a taste of the peace that "passeth understanding". Used in Reiki sessions, the stone is very effective in helping agitated clients relax completely, refreshing and energizing them at the same time. Energy healers can hold the hand in the palm while directing energy to the recipient or just place the gemstone in the recipient's hand or on their body during the treatment. The energy signature of this gorgeous Rose de France amethyst gem is every bit as profound and refined as its color and meticulously faceted features. We know you will use this powerful crystal with loving wisdom and respect its long journey in the Earth that has lasted for many long historical cycles. This crystal is a powerful tool, a love-gift from the Divine Mother. Note: Above weight is shipping weight. Average Net Weight is 4.132 grams. Each piece is unique and may vary slightly in appearance from photos. Each piece is guaranteed to be beautiful and to meet with your complete satisfaction! !